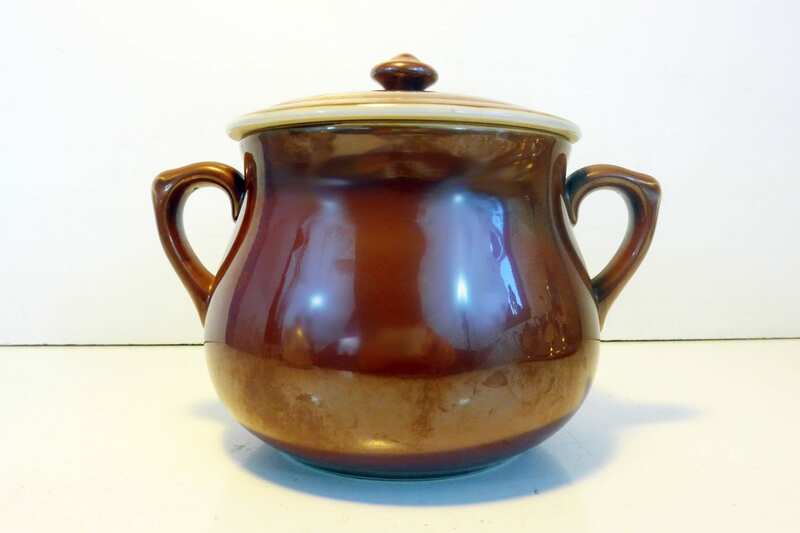 Vintage S. P. M. Bavaria luster brown bean pot or casserole dish with two handles and a lid. The S. P. M. stands for Siegmund Paul Meyer - see NOTE below about him. This is a Walkure Bayreuth item and is heat resistant and is well known for its durability. 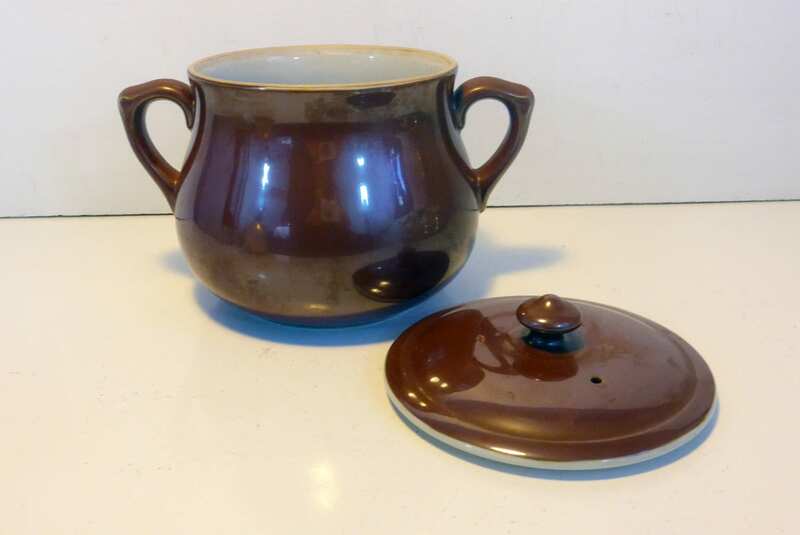 This bean pot is a great example - there are no chips or cracks in it after all these years - it is circa 1920s. 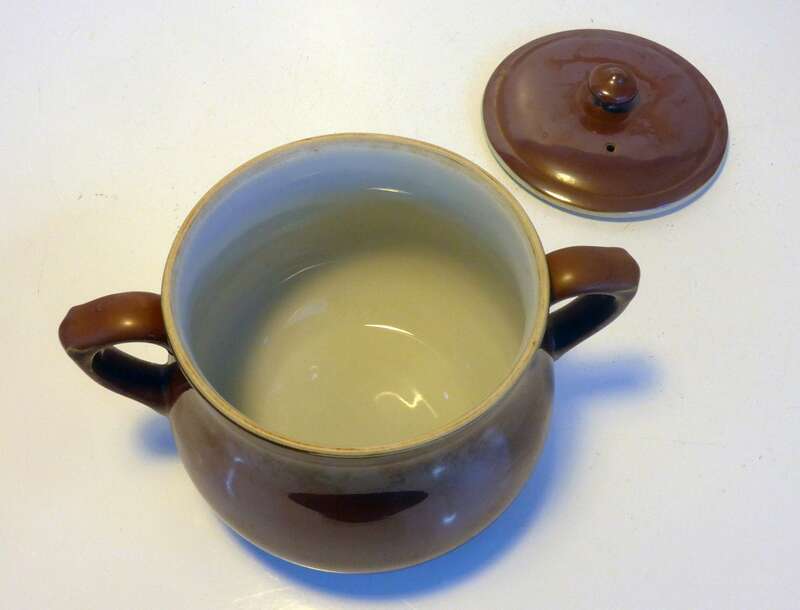 Pot has an ivory interior. 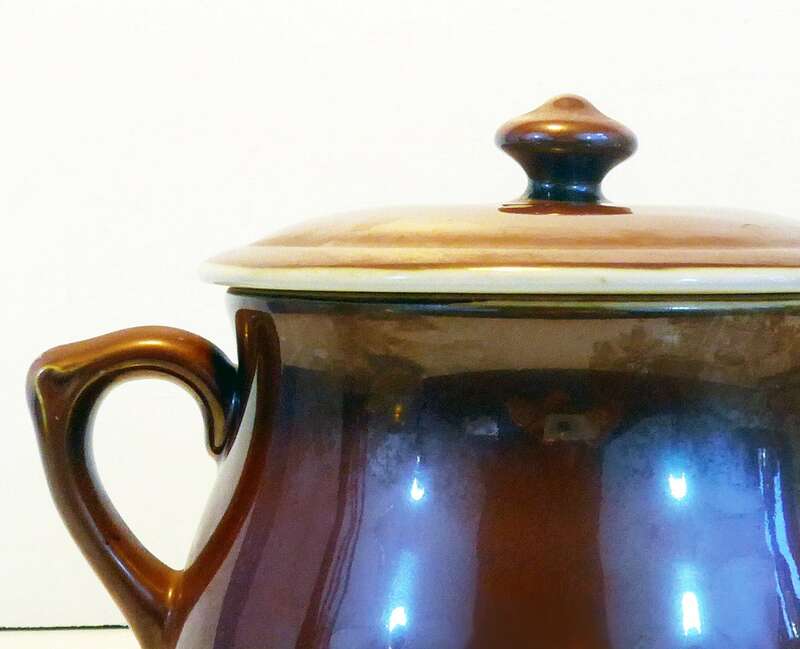 Lid has a cute knob on the top and a hole for steam to escape in it. The hallmark for SPM Bavaria and Walkure Bayreuth are stamped on the bottom and the numbers 559/3 are embossed there as well. 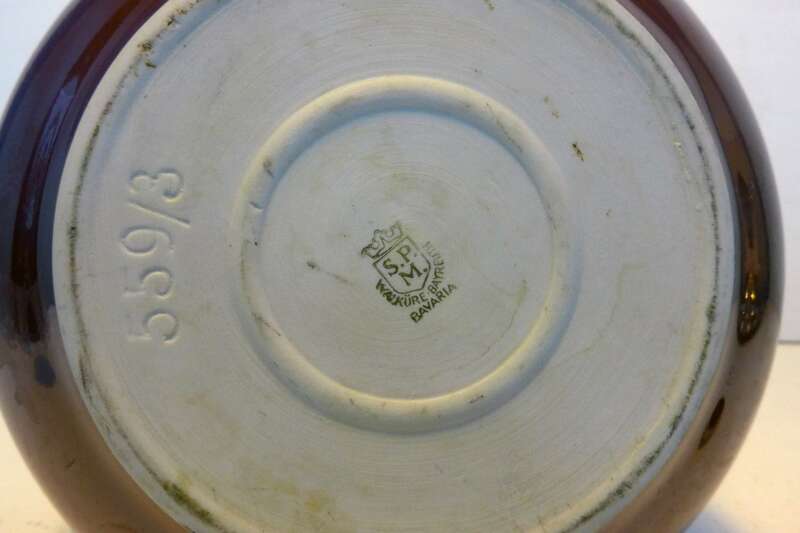 The hallmark dates this piece to the 1920s as it was used by the company until 1929. No chips or cracks. Some wear on bottom as would be expected an item of this vintage age. Measures about 6 1/2" high with the lid on. Pot itself is 5" high. Top opening has a 5 1/4" diameter. From handle to handle it is about 8" across. Bottom has a 4" diameter. Weighs 2 lbs. 12 oz. without packaging. In 1890 Siegmund Paul Meyer started to work as a salesman for a ceramics company in Bayreuth. Six years later he wanted to open his own company and so he bought the good running glass and decoration studio of Georg Bauer. The demand for his special products made at the factory increased as the main product line was a series of heat-resistant cooking and baking items under the brand name 'Walküre' (Valkyrie); a series that became well known for its high durability. During World War I things looked dire indeed as raw materials were hard to get and only a few workers were available. But the Golden Twenties resulted in a constant increase in demand, allowing the factory to re-establish itself. World War II meant that many workers had to leave for military duty. At age 75, Siegmund Paul Meyer, together with his remaining workers, managed to continue business until March 1945. But without raw materials and fuel for the kilns, production had to be stopped until Spring 1946. Production restarted followed by a constant increase due to the demand in the first years after the war. The rapidly growing economy during the mid-50's saw that more and more areas of production were automated.